Barbecue in Kansas City is a passion. The restaurants are practically hallowed ground. Once you get your first taste of hickory-smoked, dry-rub beef brisket dunked in the sweet and tangy tomato-based Kansas City barbecue sauce, you’ll become a devotee, too. In the early 1900s, Henry Perry moved from Memphis to one of the birthplaces of jazz -18th and Vine in Kansas City. He began slow cooking barbecue over a pit in an old barn, and Kansas City barbecue was born. The Bryant brothers learned from Perry, and eventually bought and developed the restaurant into one of the world’s best barbecue joints. The tradition continues; according to manager Quincy Echols, the restaurant still slow cooks its meat over hickory and oak, two of the best hardwoods for roasting. The thick and smooth sauce on the side delights, with flavors of molasses, tomato, peppers, and just a hint of vinegar. 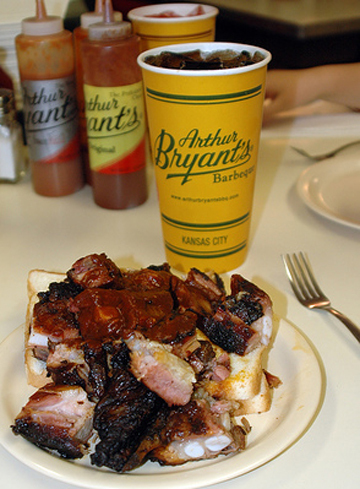 You’ll be in good company at Arthur Bryant’s; former presidents Jimmy Carter and Harry Truman have enjoyed the brisket at here, as have Steven Spielberg, Jack Nicholson, and Bryant Gumbel. As prestigious as the customers have been, reservations are not accepted. When it’s your turn to order, don’t hesitate. Ask for the beef-rib combo – a mound of sweet and tender brisket on Wonder bread and a side of ribs with a couple of pickles thrown on. You can get your dinner wrapped in paper to go, but I prefer eating at one of the café diner tables, at times literally rubbing elbows with fellow diners. Three things may put you off of Oklahoma Joe’s: the restaurant is outside of the BBQ zone in the 18th and Vine area, it’s inside a gas station, and the line at lunch is often out the door and around the block. Don’t let this throw you. There’s a reason it’s busy. Jeff Stehney and his wife started the restaurant in 1996 after winning hundreds of barbecue contests around the country with their team, Slaughterhouse Five. For both the owners and the customers here, barbecue is a pursuit and a passion. “You can drive by a dozen barbecue places before you get to Joe’s, but the reason you sneak out of the office for a two hour lunch, is to come to a place like this,” says Stehney. It’s a place where you can relax in a casual and fun environment. It’s not classy, but it’s functional and matter-of-fact, much like the customers. There is a sense of community, though half the clientele may be in suits and the other half in coveralls. 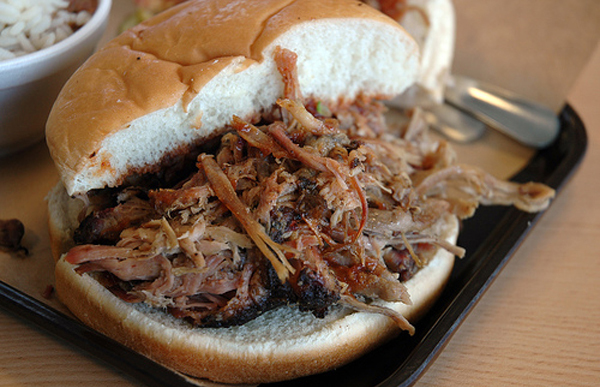 If you’re in a quandary about what to get at Joe’s, get the pulled pork. It’s known as the best in town, with smoky, spicy flavor and tender enough that it almost melts in your mouth. And if it’s the best pulled pork in Kansas City, it’s the best in the world. “Hi, may I help you?” are the first words out of staffers’ mouths as you enter Gates, though it’s more a yelled demand than a friendly greeting. The staff may not seem welcoming and the atmosphere can seem closed to outsiders at first, but ask for “burnt ends” with confidence. Typically, burnt food is trash, but these bits of meat cut from the ends of a smoked brisket are smothered in barbecue sauce and loaded onto a sandwich. The dish is a legend in Kansas City, and as you lick the last bit of thick, sweet sauce from your fingers, you’ll know why. Arthur Pinkard was one of the cooks for Perry, and he later joined forces with the Gates family. There is a subtle difference to the sauce at Gates. It has a bit more molasses than competitors. 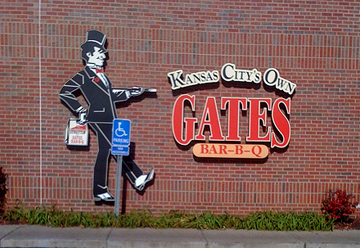 Spot a Gates restaurant (there are six in the area) by the red roof and sign featuring a man in a top hat. Inside, you’re more likely to see seed caps and trucker hats, so dress casual and be prepared to get a bit messy, and you’ll fit right in. One of the poshest places to eat barbecue in Kansas City, Fiorella’s Jack Stack Barbecue has a handful of locations across Kansas City. Overalls aren’t as welcome here, though you can still go casual. With an oak bar and leather chairs, it is the best BBQ in the heart of the Kansas City Country Club Plaza, the entertainment, art, and shopping district, featuring romantic Mediterranean style architecture, statues, and dozens of fountains… definitely a place for a romantic evening of juicy, delicious barbecue. Fiorella’s is one of the only places in the city to get barbecued seafood. The menu also has a much wider range with soups and salads and enough options that you could, though I don’t know why you would, get an entire meal there that wasn’t doused in barbecue sauce. While some purists may say this takes Fiorella’s out of the running for authentic Kansas City barbecue, you can get the complete variety of more traditional Kansas City barbecue items from burnt ends to prime rib. 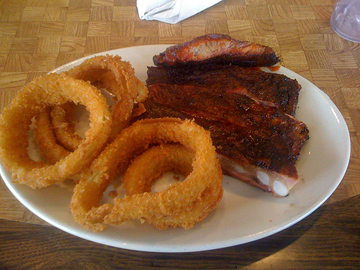 BB’s Lawnside Barbecue was opened in 1990, and it brings together two Kansas City traditions – good barbecue and good jazz and blues music. Local groups play live every night and most Sunday nights at 6 PM they feature house band Lee McBee & the Confessors, who specialize in old time soul favorites with Lee McBee on the harmonica. It can get crowded on the weekend, so make sure to get there early and be prepared to get close with fellow diners and blues lovers. The cooks smoke the ribs for 10 to 12 hours and the briskets for 14 to 16 hours in a granite barbecue pit before they’re served and they just melt in your mouth. Some of the dishes trend a bit more towards Louisiana barbecue, with a bit more spice. Try Smokey Jo’s Gumbo. It can be difficult to find bad barbecue in Kansas City. With all the competition, each restaurant is looking to outdo the others in terms of quality and, on occasion, quantity. However, there are some to avoid. It just doesn’t have the kick and flavor that you want, with meat on the dry side and fries on the greasy side. Hayward’s used to be a local favorite and more consistent with its food and service, and hopefully they turn back time and restore their former glory, but for now Hayward’s is sadly a has-been and definitely an average barbecue experience. Kansas City is one way to do barbecue, but it’s not the only way. 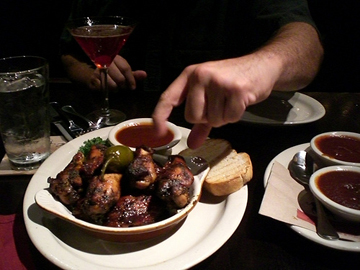 Check out Barbecue Around the World right here on Matador Nights. Still didn’t get enough Kansas City barbecue? Check out Huntington’s MatadorTravel Community blog about it or start your own.